From the Boracay beaches you see several smaller and bigger islands and you might wonder what they are like. Island hopping by sail boat in Boracay is one of the most relaxed ways to find out. 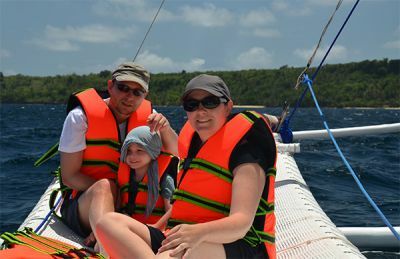 “Boracay Sailing” offers individual Island hopping tours. The sailboat “Misty Morning”, as the biggest and safest oceangoing sail boat on Boracay Island can take you even as far as Carabao Island on your private Island hopping trip. Since it is an ocean going boat, you might as well take advantage to go that far. 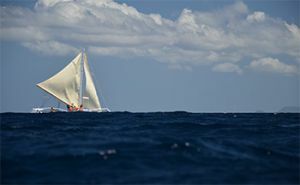 Partly you will sail on the open ocean and really feel the power of waves and winds. We offer individual Boracay island hopping tours. The major reason is, that we want to make the difference to mass tourism. You will feel like a valued person being taken care of. Our experienced crew will guide you to the places of your choice and make shure, you have an unforgettable day as your private island hopping Boracay experience. Island hopping is one of the greatest Boracay watersports activities. As one of the greatest things to do in Boracay, you can go with us for a relaxed sunset sailing tour. Sunset sailing will take around an hour. Since arround sunset the sea is fairly calm, we can take a maximum of up to 6 guests on our charter sail boat. You can also book the Island hopping tours with our Travel Agency Manila. Thank you for having visited the page: Island hopping Boracay - sail boat charter and sunset sailing Boracay.